'Doomsday Chemical' Update: Whatever Happened to Dioxin? Orange you glad we didn t say BPA? Dioxin, once proclaimed by the environmental community as the “doomsday chemical” of the 20th century and the “deadliest substance ever created by chemists,” has faded from the media spotlight. Why? Why did the EPA official who recommended the evacuation of Times Beach, Missouri, admit that he made a mistake and that the evacuation of this community following the spraying of dioxin-contaminated oil on roads, and a subsequent flood, was an unnecessary overreaction brought about by the beliefs of Dr. Vernon N. Houk, Director of The Center for Environmental Health at Centers for Disease Control and Prevention? What are the latest facts regarding adverse human health effects from exposure to dioxin? Although dioxin’s teratogenic (birth) defects in some animals were not discovered until 1970 by Dow Chemical Company scientists, the industrial community was aware of a mysterious skin disease “chloracne” since it was first reported by Herxheimer in Germany in 1899. Choracne was originally incorrectly attributed to chlorine gas exposure and only in 1957 was it recognized by the German scientists Kimmig and Schultz that dioxin impurities in certain chlorinated phenols were responsible. Unfortunately, this research paper was not widely read by the scientific community and it was not until 1969 that the existence of dioxins and their acnegenic properties were widely publicized. We now know that dioxin (really a family of related chlorinated chemicals, the most toxic of which is 2,3,7,8-tetrachlorodibeno-p-dioxin or TCDD) is produced when chlorinated phenols, used to manufacture herbicides (such as 2,4-D), insecticides, and antiseptics (hexachlorophene) are heated to a high temperature. In particular, during the manufacture of the herbicide 2,4,5-T, which, in combination with 2,4-D, comprised Agent Orange, it was necessary to heat the chemical ingredients in a large “pressure-cooker” chemical reactor. As was later discovered, if the temperature of this process is not very carefully controlled, then variable amounts of the byproduct dioxin can form. Some chemical companies were better able to control this temperature than others. In fact, of the seven companies involved in the production of 2,4,5-T for use in Agent Orange, one company consistently produced batches relatively high (>500 parts per billion) in dioxin. Although the Dow Chemical Company, the largest producer of 2,4,5-T, was eventually able to produce very “clean” — essentially dioxin-free — 2,4,5-T, public pressure forced the discontinuance of the manufacture of this chemical, despite the fact that pure 2,4,5-T has always been a perfectly safe herbicide, like the still-used 2,4-D.
Physicians and epidemiologists have been observing the health of those thousands of people (industrial workers, civilians, Vietnam veterans) who were exposed to dioxin over the past 40 years. From all these studies, described in detail below — and despite the public perception to the contrary — no human deaths can yet be attributed to dioxin exposure. The only documented health effect from dioxin exposure is chloracne, which, although often persistent and disfiguring, is not life-threatening. Just what is the latest scientific evidence regarding the human health effects of dioxin? Recent studies of Vietnam veterans reveal that their dioxin tissue levels are no different (11.7 parts-per-trillion, “ppt”) than those both of non-Vietnam veterans (10.9 ppt) (soldiers who had never been to Vietnam), and of a civilian control group (12.4 ppt), suggesting that “heavy exposure to Agent Orange or dioxin for most U.S. troops in Vietnam was unlikely.” (The slight differences are within experimental error and are not significant.) Even more revealing is an extensive on-going 20-year mortality and health-effects evaluation of 995 Air Force Ranch Hands, the personnel who handled and sprayed Agent Orange and some of whom have relatively high concentrations of dioxin (>300 ppt) 15 years after exposure. In this group of veterans, there was no chloracne observed, no increase in nine immune system tests, and no increase in melanoma and systemic cancer (lung, colon, testicles, bladder, kidney, prostate, Hodgkin’s disease, soft tissue sarcoma, non-Hodgkin’s lymphoma). The authors of this 1990 study conclude that “there is insufficient scientific evidence to implicate a causal relationship between herbicide exposure and adverse health in the Ranch Hand Group.” An October 1991 update recently provided by Dr. William Wolfe, the senior physician in charge of this study, reaffirms these conclusions. Studies of more than 800 occupationally exposure workers in nine industrial plant accidents, including those in the massive Nitro, WV, Monsanto accident in 1949, and chemical mishaps in 2,4,5-trichlorophenol plants in England, Germany, France, Czechoslovakia, The Netherlands, and the U.S. fail to indicate serious long term health effects in these men, some of whom have dioxin concentrations exceeding 1000 ppt 30 years after their initial exposure. Some 465 cases of chloracne were observed in these workers. A study of 2,200 Dow Chemical workers who were potentially exposed to dioxin revealed that they had a slightly lower mortality than a control group, and have no total cancer increase. Dr. P. Bertazzi of the Institute of Occupational Health, University of Milan, last year published a detailed evaluation of the human health effects of the Seveso, Italy, accident, in July of 1976, involving 37,000 people. Although some of the exposed children in “Zone A,” the area of heaviest exposure, had dioxin tissue levels as high as 56,000 ppt immediately following the accident in 1976 — the highest dioxin level ever measured in a human — the only adverse health effect to date is chloracne. Of the 193 cases of chloracne, 170 were in children under the age of 15, and the skin lesions in all but one of these cases had disappeared by 1985. Although we need to continue to monitor the health of the people in Seveso, Dr. Bertazzi concludes that there are “no increased birth defects due to dioxin exposure,” as the children born during the period from 1977-1982 failed to demonstrate an increased risk of birth defects. Similarly, the aborted fetuses shows no conclusive abnormalities. The cancer mortality findings after 10 years do not allow firm conclusions to be drawn, although mortality from cancer of the liver, one of the organs targeted by dioxin, is no different from unexposed people. There is no doubt that the family of chemicals known as “dioxins” and the related dibenzofurans have a unique and unusual toxicity in some animals (e.g., guinea pigs, horses, mice, the Long-Evans rat), but are much less toxic — in some cases a thousand fold— in other animals (e.g., hamsters, dogs, the Han-Wistar rat, and, it would appear, man). The general presumption by politicians, the media, and environmental groups that dioxin is highly toxic to humans even at very low doses just is not supported by the scientific and medical evidence. The only documented health effects in humans are chloracne and mild, reversible peripheral neuropathy and liver enzyme induction. Simply put, and despite the protestations of environmental apocalyptics, dioxin is not the “doomsday chemical” that they would have us believe. Although adverse health effects in humans have not been linked definitively to dioxin, despite our fears to the contrary, the past 10 years have uncovered much new information about this extraordinary chemical. Not only is dioxin produced when nearly any organic material is burned (leaded gasoline, wood, municipal and hospital waste, tobacco), but it is estimated by some scientists that forest and brush fires are the leading source of dioxins in our environment. It is approximated that Canadian forest fires produce annually 10 times the amount of dioxin emitted in the Seveso accident! Since most of the world’s annual 200,000 forest fires are lightning caused, it is obvious that much dioxin is naturally produced, and, in fact, has undoubtedly been an “environmental pollutant” since the first forest fire on earth! A soil sample preserved from 1877 was recently found to contain dioxin. Since dioxins are slowly biodegradable, they have not accumulated as much as one might have expected based on this new scientific data. Even more astounding is the observation that natural enzymatic processes have the ability to produce dioxin from chlorinated phenols! That is, the same chemical reaction leading to dioxins in high temperature industrial reactors is duplicated naturally by ubiquitous enzymes. This extraordinary find, published by one of the world’s leading dioxin researchers, Dr. Rappe of Sweden, opens the door to the possibility that a heretofore unrecognized source of dioxin in their biological production from chlorinated phenols, which themselves are found in an array of natural organisms (insects, marine animals, sponges, seaweed). This may explain the “background” levels of dioxin found in most, if not all humans. For example, a group of men in their 70s who have lived in the western U.S. desert for all of their lives were found to contain 6-7 ppt dioxin in their adipose tissue, despite the fact that they were never exposed to a recognized source of dioxin. Nevertheless, over the period 1972-1981, dioxin levels are decreasing in humans, probably as a result of the phase-out of leaded gasoline and the greater control exerted over incinerators. It is interesting to note that the U.S. chemist who, as a graduate student in 1956, first synthesized many members of the dioxin family (including TCDD itself) before their toxicity was realized, is in good health today some 35 years later, as a company president, although he still carries 18 ppt dioxin and 625 ppt of the corresponding bromo dioxin in his blood from his very heavy exposure to these chemicals. From the rate of biodegradation of dioxin in humans, one can extrapolate that his initial dioxin tissue content may have been as high as 146,000 ppt. One can calculate that his exposure to 16 grams (about 1/2 oz) of dioxin was equivalent to being exposed all at once to nine tons of Agent Orange contaminated with dioxin at a level of 2 ppm, the average level of contamination of defoliant used in Vietnam. Finally, an irony is that the 1,3,6,8-tetrachlorodibenzo-p-dioxin analogue of TCDD has anticancer properties against human breast cancer, as reported last year in a chemical patent from Texas A & M University, and, thus, dioxin derivatives may ultimately prove useful in saving lives. Republished from the American Council on Science and Health print magazine Priorities, also available as a PDF here. 1) Tschirley, F.H. 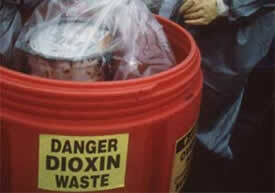 “Dioxin,” Scientific American 254 (No. 2): 29-35, 1986. 2) Eduljee, G.H. “Dioxins in the Environment,” Chemistry in Britain 24: 1223-1226, 1988. 3) Gough, M. “Human Health Effects: What the Data Indicate,” The Science of the Total Environment 104: 129-158, 1991. 4) Gough, M. “Agent Orange: Exposure and Policy,” American Journal of Public Health 81 (No. 3): 289-290, 1991. 5) Bertazzi, P.A. “Long-term Effects of Chemical Disasters. Lessons and Results from Seveso,” The Science of the Total Environment 106: 5-20, 1991. 6) Wolfe, W.H. et al. “Health Status of Air Force Veterans Occupationally Exposed to Herbicides in Vietnam, I. Physical Health; II. Mortality,” Journal of the American Medical Association 264: 1824-1836, 1990. 7) Ames, B.N. “Natural Carcinogens and Dioxin,” The Science of the Total Environment 104: 159-166, 1991. 8) Kang, H.K. et al. “Dioxins and Dibenzofurans in Adipose Tissue of US Vietnam Veterans and Controls,” American Journal of Public Health 81 (No. 3): 344-349, 1991.